This recipe takes about 4 hours in all (excluding dough resting time) to prepare. Given it's difficulty, I will rate it a difficulty level 4 out of 5. Here are the 3 essential ingredients for the skin. 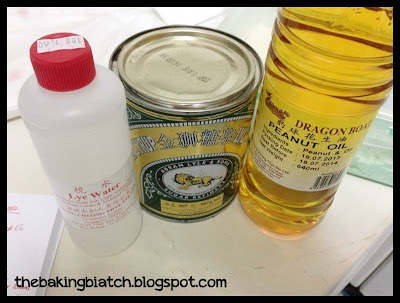 Peanut oil helps make the dough more fragrant though other oils work just as well. 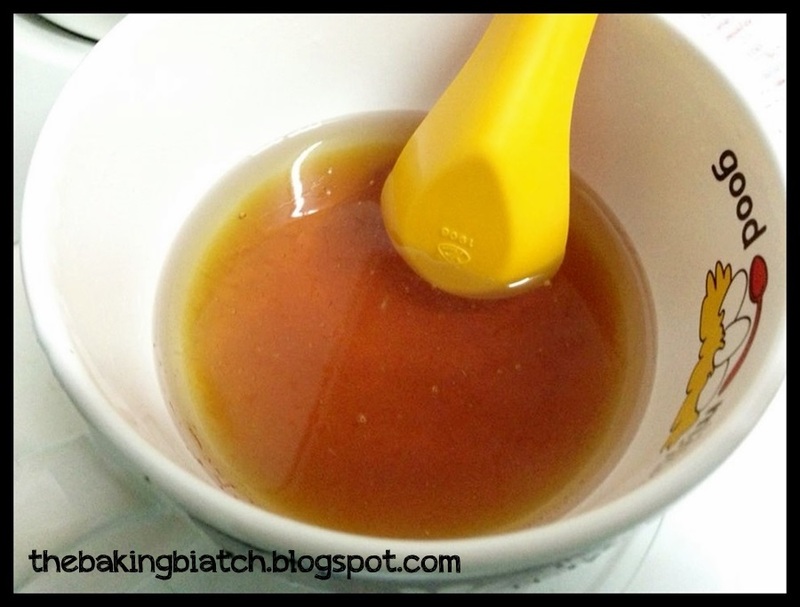 Alkaline water may seem tiny in quantity but it is essential for the browning of the moon cakes. Have the alkaline water, golden syrup and peanut oil in a bowl. Mix well. 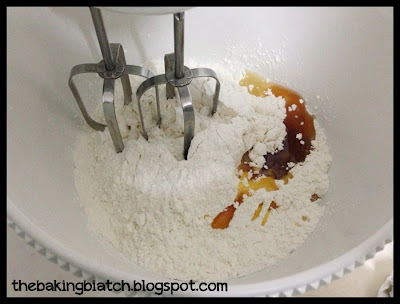 Have the plain flour in a mixing bowl. 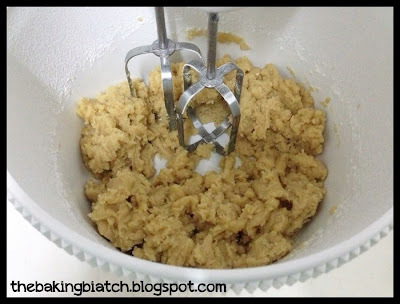 Add the golden syrup mixture poured in a little at a time into the dough. The dough after the golden syrup mixture has been added. On medium speed, mix the dough for 5 - 8 minutes till you get a dough like this. 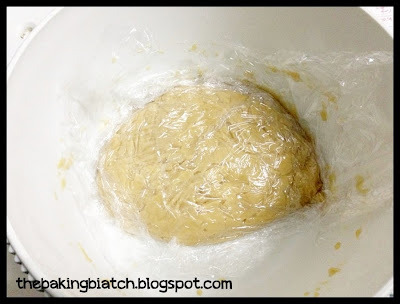 Cover with cling wrap on the surface of the dough and let it rest for a minimum of 5 hours. I left mine to rest overnight for about 10 hours. 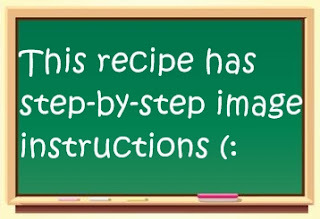 Preheat the oven to 160 degree Celsius. Toast the melon seeds for 8 minutes, shaking them occasionally to allow even heating. Allow to cool. To the lotus paste, add the melon seeds. 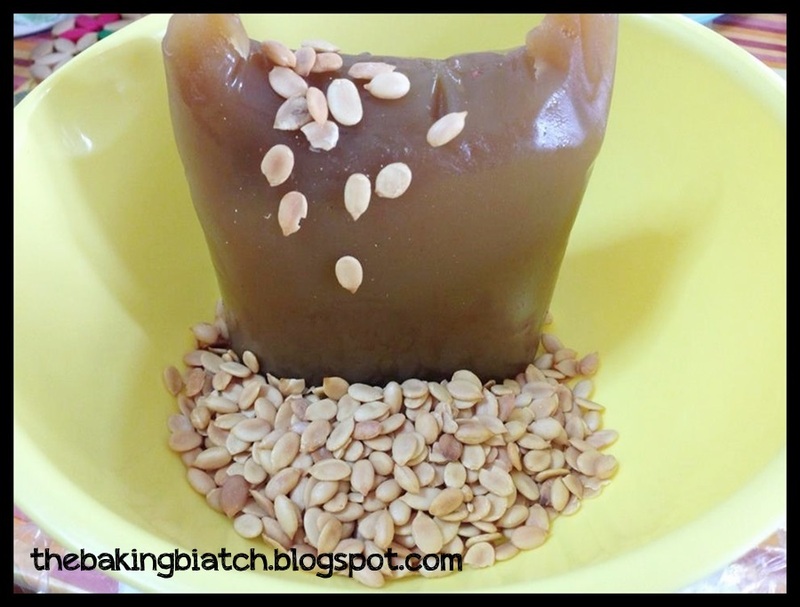 Using your hands, mix the melon seeds into the paste. Weigh out 31g of paste for each moon cake. Roll them into balls. 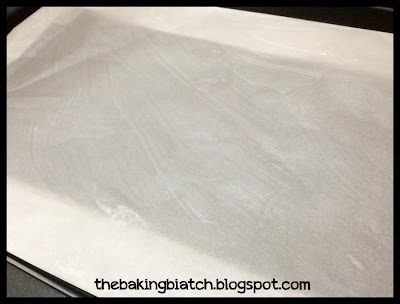 Line the baking tin with baking paper. 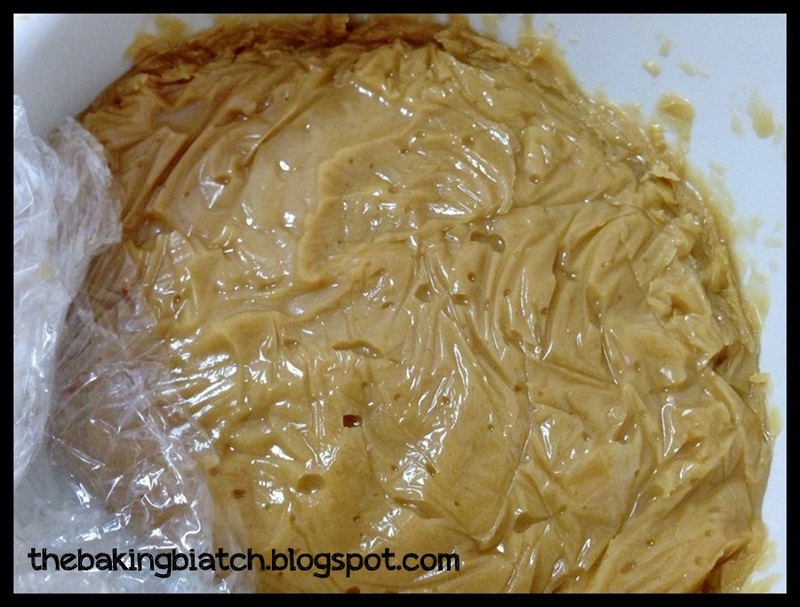 Grease the baking paper with some shortening. This is the dough that has been left to rest for a night. Weigh out 16g of dough and roll them into round balls. 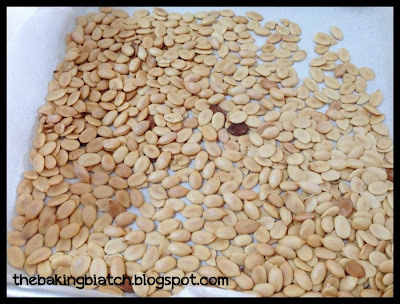 Flatten them between 2 sheets of plastic wrap. 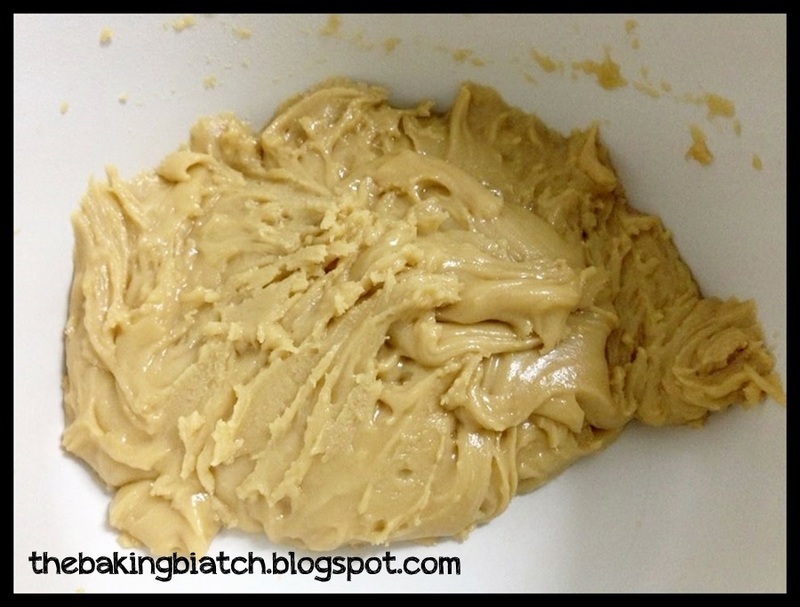 Wrap the dough around the paste. 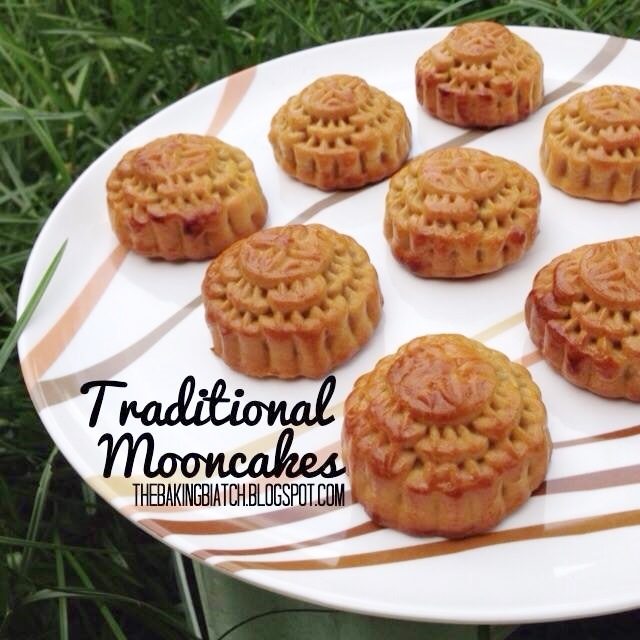 Roll the moon cake to make it round. Dust the mould with plain flour. Knock out excess flour from the mould. 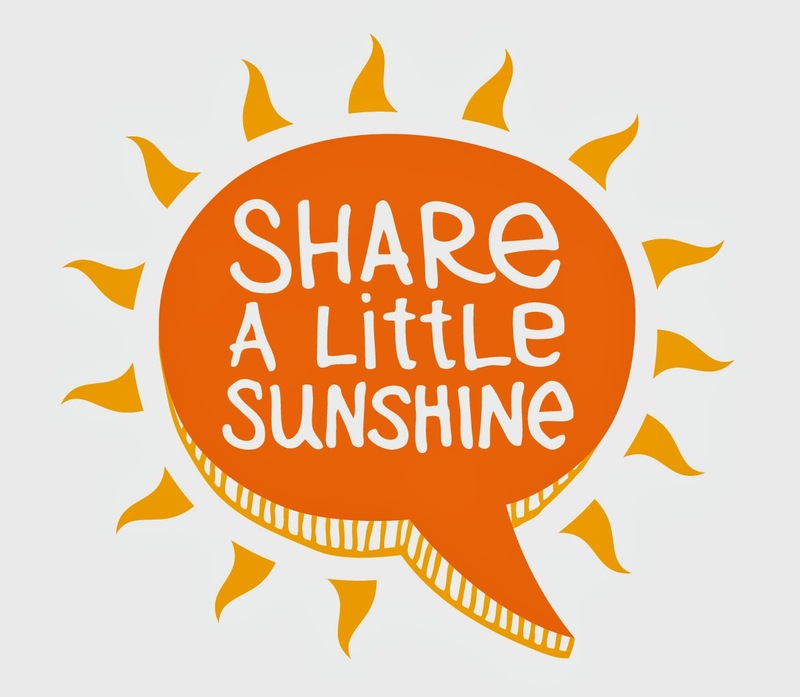 Watch this video for snowskin moon cakes! 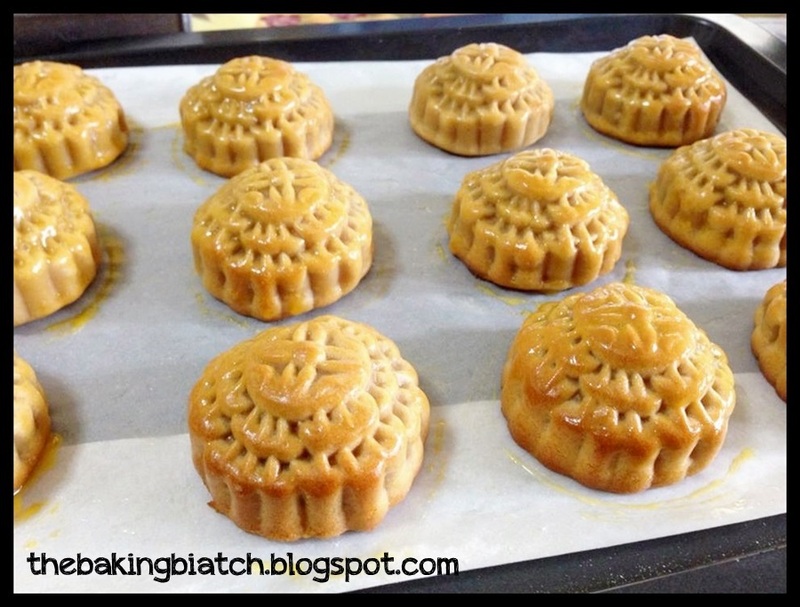 It will really give you a better idea of how to shape the moon cakes! 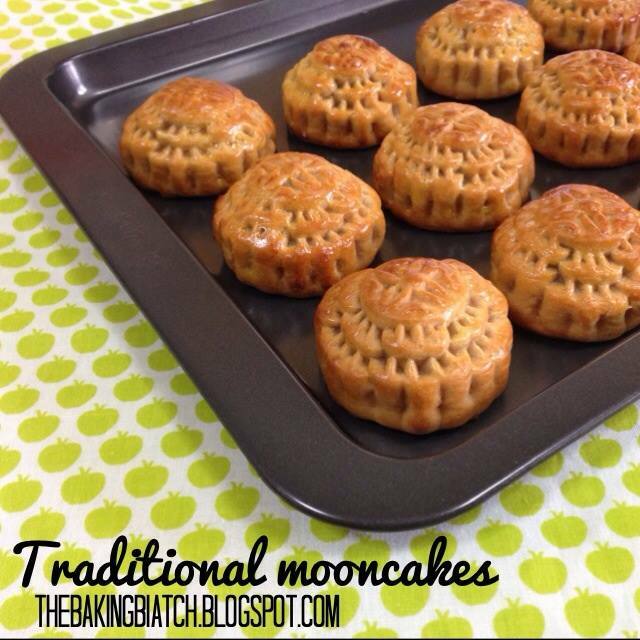 Press the moon cake into the mould and knock it out of the mould. Place on the greased baking paper. Preheat oven to 220 degree Celsius, fan mode. 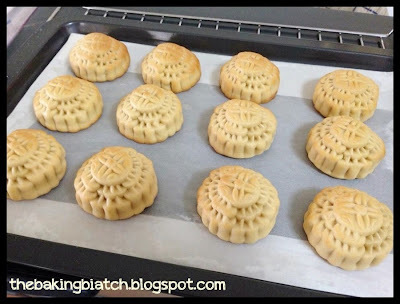 Bake the moon cakes for 4 minutes 30 seconds - 5 minutes till the moon cakes are lightly browned. Allow moon cakes to cool for 10 - 20 minutes. Make an egg wash using 1 yolk and 1 tbsp of egg white. Apply the egg wash on the moon cakes. 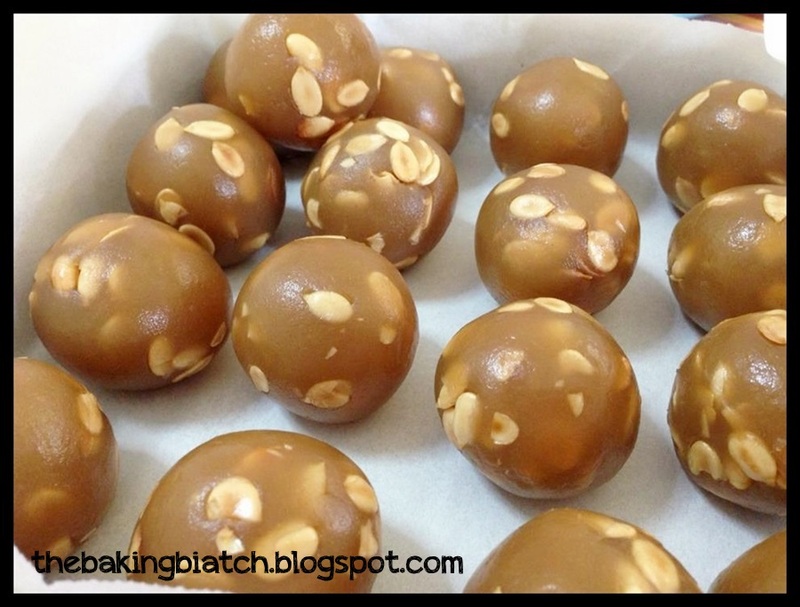 Bake the moon cakes for another 4 - 5 minutes till the moon cakes are browned. I need a new oven for more even heat distribution in my oven! 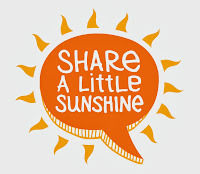 Mine's about 2 years old I guess.. so it maybe time for a change! 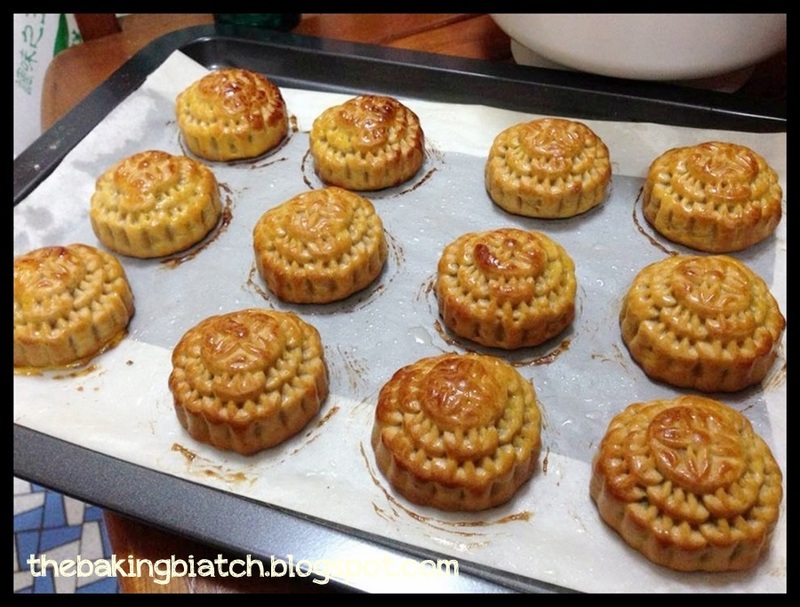 Anyway, allow the mooncakes to cool. 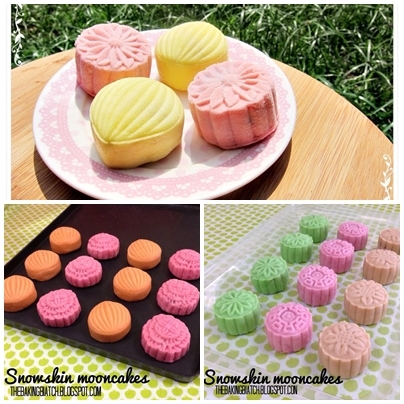 Leave the mooncakes in an air tight container to store for 3 - 5 days for it to 出油. 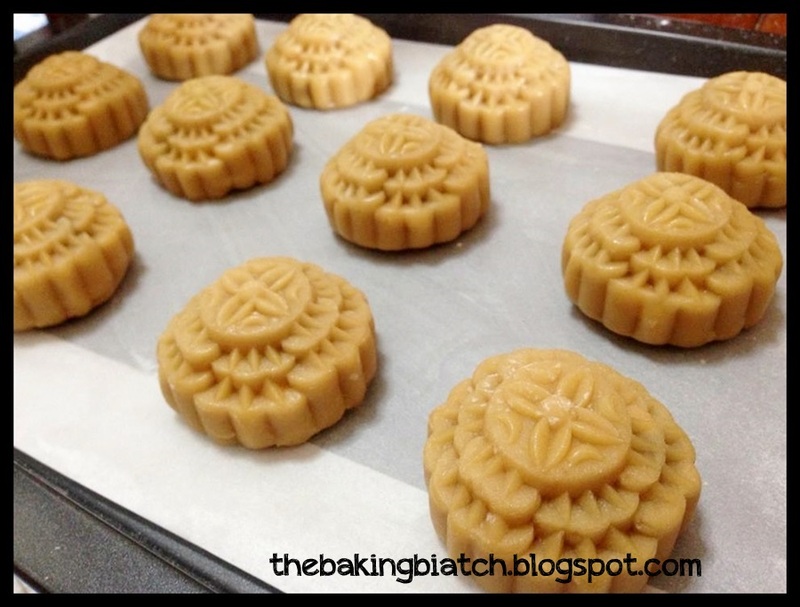 Then, the mooncakes will be glossy and shiny the way they should be.